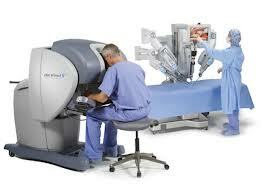 DaVinci Robotic Surgery: Technological Breakthrough or Overhyped Disaster? The DaVinci robotic surgery system by Intuitive Surgical, Inc. is a high tech, 3D “robot” remotely operated by a surgeon. The DaVinci system is the hottest new product, touted by Intuitive and the hospitals it sells the system to as the greatest thing since the invention of the scalpel. They promise more precision, faster recovery and other benefits. But is it all that? Reality is substantially at odds with the marketing hype. The DaVinci robot is, at its core, simply another way to perform laparoscopic surgery. Laparoscopic minimally invasive surgery has been around for 20+ years and is utilized in many common surgical procedures: gallbladder, hysterectomy, prostatectomy, hernia and many others. Laparoscopic surgery is performed by a surgeon who places ports into the abdomen and insufflates the abdominal cavity with gas to allow for room to insert and manipulate surgical instruments through the ports. A camera and light are inserted through one port, so that the surgeon can see inside the patient on a video monitor. The surgeon directly manipulates the instruments through the portals. For more on laparoscopic surgery, see this article in Wikapdia. The DaVinci system differs in that the surgeon’s direct contact with the instruments is severed. Traditional portals are placed, but then instruments and camera are inserted and these are attached to the DaVinci robot system. The surgeon, although still in the same OR room, sits at a remote console and operates the instruments via joystick-like controllers. An easy way to visualize it is to say it is like he is playing a video game. Except in this case, he doesn’t get to simply start over if a problem arises. Intuitive has saturated the market with the DaVinci robot, by hyping the purported advantages of the system. They claim that the robotic system allows the surgeon an unprecedented 3D view inside the patient, as opposed to the 2D view of traditional laparoscopy. They assert that the system allows for the surgeon to make minutely accurate motions, because he or she can move their hands in the controls but have that translate to only millimeter movements inside the patient. It all sounds great. But the reality is not quite equal to the hype. Reports have indicated problems with the robotic arms moving independently, causing internal injuries. Reports exist that the electric cautery instruments used in parts of certain procedures are sending electrical arcs out and causing burn injuries to adjacent organs or even causing remote injuries to organs far removed from the surgical location due to improper grounding. There have been reports of the system simply freezing during a procedure. Even more frightening are the indications that hospitals are allowing surgeons to utilize the DaVinci with very little training and very little supervision. Any time a new surgical technique or tool is introduced, the surgeon and the hospital have a responsibility to make sure the surgeon has adequate training. Some sources indicate that a surgeon may require 100 or more surgeries before he is technically competent with the DaVinci. However, hospitals are not requiring anything like 100 supervised surgeries before turning the surgeon loose to fly solo on the DaVinci. In fact, some are requiring little more that a weekend training session. Suffice it to say, that we anticipate significant malpractice claims arising out of the use of DaVinci robotic surgery systems. Product liability claims against Intuitive may be warranted in some cases. But even more likely are cases against the surgeons and the hospitals for malpractice, failure to advise the patients of the surgeon’s lack of experience, inadequate training of support staff and many other issues. If you or a loved one has experienced injuries in connection with a DaVinci robotic surgical procedure, please contact our office for a consultation. Only an experienced medical malpractice attorney can tell you whether or not you have a case.